Click on a unit to get started. 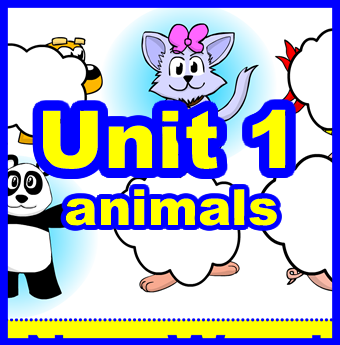 The theme of HEE unit 1 is animals. If you know me, you know that starting with animals is not surprising. Not surprising at all! Students absolutely love animals and will usually start talking right away! The animals theme also leads itself easily to Total Physical Response (TPR) actions and in turn, lots of smiles and laughter in the classroom. The theme of HEE unit 2 is colors. Moving on from unit 1, we enter the wonderful rainbow world of colors! Colors are all around us and just like animals, students have strong opinions about colors. The theme of HEE unit 4 is parts of the face. In this unit, students learn the different parts of the face. They’ll also be able to naturally use all of the vocabulary from units 1-3 through various practice activities.